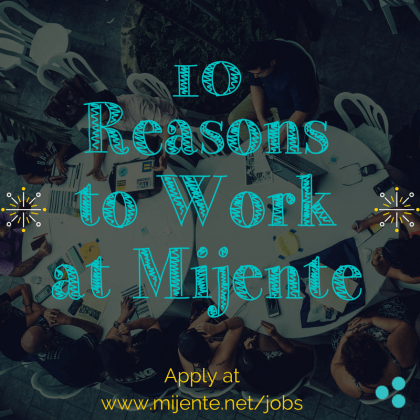 10 REASONS TO WORK AT MIJENTE! In case you missed it, we’re hiring! We’re excited to bring on two new folks into our Mijente staff team: a Campaign Director and a Deputy Director to help us grow and strengthen our work. Is this you? Is it someone you know? 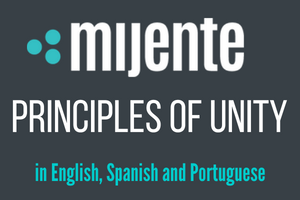 In case there are any doubts, below we share 10 reasons why working at Mijente is the way to go! Don’t worry, there are many more reasons but these should give you a pretty good idea. We believe in our people and in building real, collective power. We put our efforts into work that we can be proud of, that brings about tangible change for our communities and that is worthy of our people’s time and energy. We go after the evils that come for us. We know our enemies and we don’t shy away from going after the racists, sexists, homophobes, transphobes, colonizers, elitists, xenophobes and other oppressive forces that attack us. We give it all we’ve got for our people! We believe our best bet at winning is through organizing at the grassroots level, in electoral fights, through direct action and digitally. We embrace the frame of building our collective power without, within, and against the state. We’re each other’s movement cheerleaders and lift each other up as we do this hard work. We deeply value each other’s time and make it a point to bring joy and high energy to our collective team. We have fun names for our gatherings and events! We love Spanglish and often come up with all kinds of wild names for our convenings and different projects. Perhaps you’ve been to Lánzate or our Sazonblea? You’ll get to work with a bunch of rowdy, serious, dedicated, and fun people. We very much believe in working hard, playing hard and then working even harder while having lots of fun along the way. We value experimentation and innovation in our organizing and in our work culture. We come out of the Not1More Deportation Campaign and embrace an open-source model of organizing. We aim for creative outcomes and go through creative processes to get there. We strive to tailor our “professional” lives to our personal lives because we recognize that we are people, not non-profit machines. We work hard to ensure that our staffing structures are sustainable for both the individuals and the organization. We offer some seriously awesome benefits. We try to get creative with compensation, paid time off, health-benefits, and many other forms of self-care and community-care for our team. We work remotely and are on the move! You can work from your home, your favorite coffee shop, maybe even your favorite bar if that works for you. We also get to travel to different cities and towns to connect with our people.